The practical session for this hybrid course is held on campus. Lectures and some simple labs are held in a traditional classroom setting with simulation sites nearby. Lodging: Lots of hotel and AirBnB options available in Laramie. Camping: The nearest camping is approximately 25 minutes away at the Vedauwoo Campground. For information, contact the Medicine Bow National Forest office at (307) 745-2300. 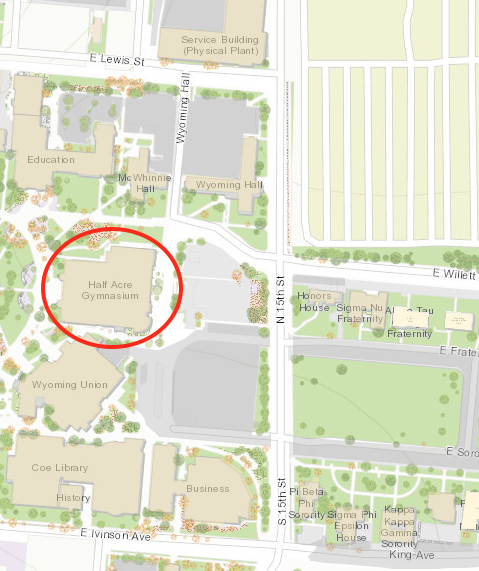 Classroom: Half Acre Recreation and Wellness Center—shown as Half Acre Gymnasium on the map) rooms 115 & 117. Please access the building from the west (historic) side entrance. Parking: There are no fees for parking in valid spaces on campus during the weekend. The Union parking lot is the closest lot to the classroom. Lunch: There are a handful of dining options available to all course participants in the Student Union.